They seem like four best friends on the playground. Laura Frances has shoved herself into the baby swing and is begging for a push. Mary Carter and Elizabeth are on the big swings, each trying to go the highest. Charles Shepherd, known as Shep, is playfully throwing mulch at the girls until his mother intervenes. The best friends are actually quadruplets—one brother and three sisters. They are all exuberant in how they play and talk about their favorite school subjects. They share the same big, bright smile and will do a cartwheel or handstand at any moment. Nine years ago, the Rice quadruplets entered the world too soon. They were born at 26 weeks, barely over halfway through the normal 40-week pregnancy gestation period. The staff in the Neonatal Intensive Care Unit (NICU) at Monroe Carell Jr. Children’s Hospital at Vanderbilt did everything they could to ensure the quadruplets would survive. The babies endured infections, kidney failure, underdeveloped lungs, feeding issues and heart surgery. At birth, they each weighed less than 2 pounds and could fit in the palm of your hand. Today, they are all over 3 feet tall. The third graders, who attend Pearre Creek Elementary School in Franklin, Tennessee, are growing and thriving. Children’s Hospital is growing too, to give more children like Shep, Elizabeth, Laura Frances and Mary Carter a healthier childhood. The $30 million Growing to New Heights Campaign is underway in support of a four-floor building expansion that will help advance the size and scope of the hospital’s existing comprehensive and specialized pediatric health care programs. The new construction, when fully completed, will add 160,000 square feet atop the hospital’s existing structure, and will provide the necessary space to meet the future health care needs of children and families. Construction is expected to begin this year. The first floor to be completed will provide approximately 40,000 square feet of new space and will include 38 critical care beds for newborns, pediatric patients who have undergone transplants or neurosurgery, and other critical care patients. The new floor will also include family areas, a playroom, a large waiting room, educational space and patient consultation rooms. Children’s Hospital has seen unprecedented growth, far greater than ever imagined, since the freestanding building opened over a decade ago. To help serve more children and meet an ever-increasing demand for an array of services, an initial expansion opened in 2012, creating an additional 33 beds and adding 30,000 square feet to the existing structure. Patients come from across the nation to receive the hospital’s highly specialized services. During fiscal year 2014, there were more than 250,000 ambulatory visits, and 15,000 children were admitted as inpatients. Children’s Hospital treated patients from 48 states. The concept of children’s health care in Nashville has evolved over the years, beginning with its deepest roots in the 1920s as the Junior League of Nashville Home for Crippled Children. In the 1970s, then chair of Pediatrics David T. Karzon M.D., instituted the “hospital-within-a-hospital” concept,” in which Children’s Hospital occupied three floors within Vanderbilt University Hospital. The freestanding facility, known today as Monroe Carell Jr. Children’s Hospital at Vanderbilt, opened in 2004, carrying on the same decades-long mission: to be a place of hope, healing and discovery for all children and families. “This hospital is a love affair between the people who work here and the children and families that we serve. It’s very important to us that we have the facilities to give them the very best in care so that we can handle not only the bumps and bruises of every child, but also help children who are the very sickest of the sick,” said John W. Brock III, M.D., surgeon-in-chief, Monroe Carell Jr. Professor and director of the Division of Pediatric Urology. The Rice quadruplets spent several months as inpatients to develop their tiny bodies until one by one they could go home. “We are so thankful the Children’s Hospital is there. I don’t know what we would have done without it. It is such a blessing,” said Ann Rice. Ann says the quadruplets are “pretty close to perfect” and have no lasting effects from their early birth and time in the NICU. But that future was very uncertain in the months after their birth on Oct. 17, 2005. “Mary Carter was definitely the sickest child. We were told she would probably never come home. The NICU staff always said it would be a rollercoaster ride, and it was. There were grim days, lots of ups and downs, and we really didn’t know what the outcome would be,” Ann recalled. The family delicately balanced having four children with serious health needs. The balance became especially difficult when Shep and Elizabeth, always the strongest babies, were discharged home after three months in the NICU. “It actually kind of eased us into caring for four in a way. It was very trying, but the support from the nurses was phenomenal. We knew our children were in the best place and they were well taken care of,” Ann said. The babies’ father, Chuck, would go by the hospital before work to get the morning update, and Ann’s mother retired from teaching to be a permanent caregiver. Laura Frances stayed in the NICU for four months, and Mary Carter stayed five. Ann and Chuck weren’t even able to hold Mary Carter until after Christmas. All the babies went home on oxygen, and their health needs continued well after they left the NICU. “They had follow-ups for years afterward—heart, kidney, pulmonary. We were at the hospital every week for the first year and a half,” Ann said. 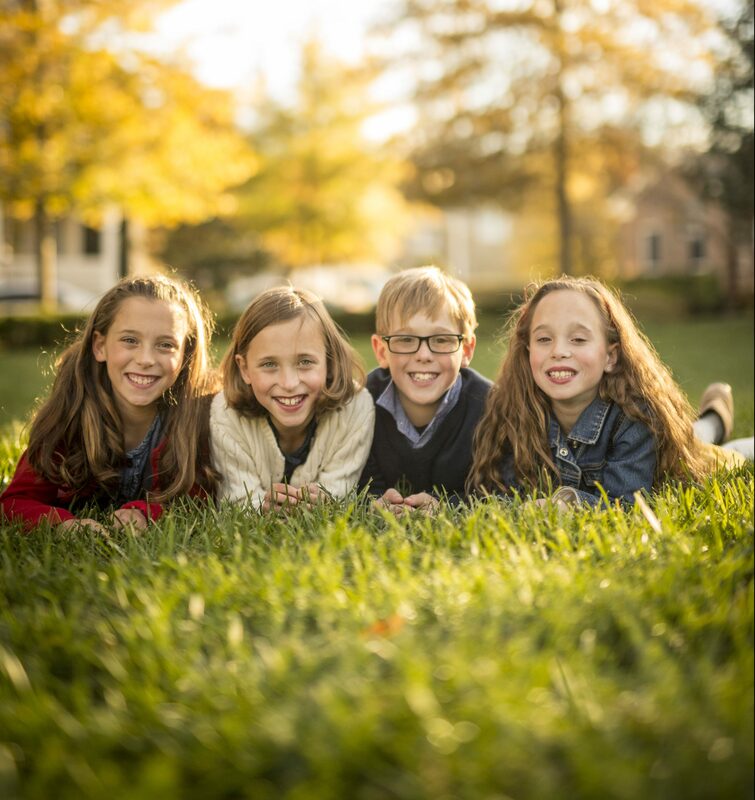 Today they are active in their church, and Shep is on a travel soccer team, Laura Frances had her first horse show this past fall and Elizabeth and Mary Carter do gymnastics. “Shep is definitely the big brother and leader of the pack, but they are very much their own person with their own personality and interests. They can squabble with the best of them, but they’re very tight and take up for each other,” Ann said. And with four children, the Rice family has made many return trips to Children’s Hospital for the usual childhood illnesses and accidents. The Rice family’s sentiments echo what Monroe Carell Jr. and his wife, Ann Scott Carell, envisioned in 1999 when they made the lead gift to build Nashville’s first freestanding children’s hospital—a facility that was not only the best at medical care but a warm, compassionate and even fun place for children and their families. A decade later that legacy continues with the Carell daughters, Kathryn Brown, Julie Stadler and Edie Johnson, as they and their families contribute $10 million to the Growing to New Heights Campaign. “Our family has always been very close, and our parents always taught us that it was important to help other people. My sisters and I are honored to build on their legacy and ensure that the Children’s Hospital continues to grow and thrive and be so helpful to our community,” Brown said. The goal of the Growing to New Heights Campaign is to raise $30 million over three years to support the estimated $100 million cost of the expansion. A four-floor expansion at Children’s Hospital will be built atop the hospital’s existing southeast facade, adding more than 160,000 square feet of space. “We are enormously grateful for the engaged support from the Carell family and from our wider community that has empowered the Monroe Carell Jr. Children’s Hospital at Vanderbilt to meet the increased need for care and continue our work in finding new discoveries in children’s health,” said Nicholas S. Zeppos, chancellor, Vanderbilt University. Monroe Carell Jr. was the former chairman of Central Parking Corporation, and he and Ann were longtime philanthropic leaders in Nashville. They shared a deep commitment to the children of Middle Tennessee, supporting health and education causes, and were instrumental in fundraising for the freestanding Children’s Hospital. “Every time I walk in the building, I think of my parents. They would be so excited at the work that is being done here and the passion that all the staff have,” Brown said. Brown, a member of the Children’s Hospital Board, is also chairing the Growing to New Heights Campaign. Brown has also rallied a group of co-chairs eager to meet the fundraising goal. Community leader co-chairs include: Kix Brooks, entertainer, radio host and entrepreneur; Rick Dreiling, chairman and chief executive officer, Dollar General Corporation; Steven Hostetter, chief executive officer, TriStar Energy LLC; Bob Rolfe, chief executive officer, Medical Reimbursements of America, Inc.; and Clarence Spalding, president, Spalding Entertainment. “The campaign is about meeting the needs of children in the region. But it’s not just Nashville; all walks of life come here knowing the care is as good as they can get and the answers they seek are there. It’s a panacea of hope for people who desperately need something to cling to,” said Steven Hostetter, chairman of the Children’s Hospital Board. Clarence Spalding says supporting the hospital is a gift he was given through the passion of the country music artists he represents. Kix Brooks adopted the hospital early in his career, and Rascal Flatts followed his lead to become major supporters. “When you visit that hospital, you come out knowing you can’t ever do enough. I have two children, and that hits home all the time. We’re trying to shine the light a little brighter so others in a position to help can give as well,” Spalding said.